Home /Asia/South East Asia/Burma/Myanmar/Myanmar: Democratic Progress or Authoritarian Rollback? While Myanmar has seen incredible sociopolitical change since 2011, climaxing with the landslide victory of Aung San Suu Kyi and her party, the National League for Democracy (NLD), in the 2015 general election, many recent developments have caused widespread concern among commentators. The number of political prisoners has surged, attacks on the freedom of the press have re-occurred and, most recently, the military has been accused of ethnic cleansing in Rakhine State, to name but a few. After almost 18 months in office, Myanmar under the NLD government seems to have seen significant authoritarian setbacks. But has Myanmar really become more authoritarian again under the NLD? This article tries to take stock of Myanmar’s democratic transition in 2017 and looks at tangible data. Robert Dahl has proposed probably the most widely accepted definition of democracy. According to Dahl, for democracy to be realised, eight institutional guarantees need to be established in the course of a democratic transition. Because an election is not within the time frame of this brief analysis, five of Dahl’s institutional guarantees that are concerned with representative democratic institutions (ergo elections and political participatory rights) will not be addressed here. Nevertheless, the remaining three institutional guarantees for democracy, (1) freedom of association, assembly and expression, (2) an independent and free media, and (3) the dependence of public policies on citizens’ preferences, can shed light on aspects of democracy that go far beyond elections and, hence, are worthwhile to look at in the case of Myanmar. Basic civil liberties allow the airing of opposition to, debate of, and organisation against the working of the government and legislature, controlling them in between elections. In a reaction to the 1988 mass protests, the military junta, which ruled Myanmar for the last quarter of a century with an iron fist, effectively abolished most forms of free expression and association (see SLORC Order No. 1/1988). The 2008 constitution, however, restated these rights, which have widely become practiced again in the aftermath. Right after the military-proxy government under president Thein Sein took office, it pardoned many hundreds of prisoners of conscience who had been imprisoned and sentenced in the past because of “offences” such as unlawful assembly or dissent. However, while the number of activists in jail has constantly decreased from 2,073 in March 2011 to only 110 in March 2016, the numbers have surged again in the aftermath of the NLD’s taking office in March 2016 (see Table 1). 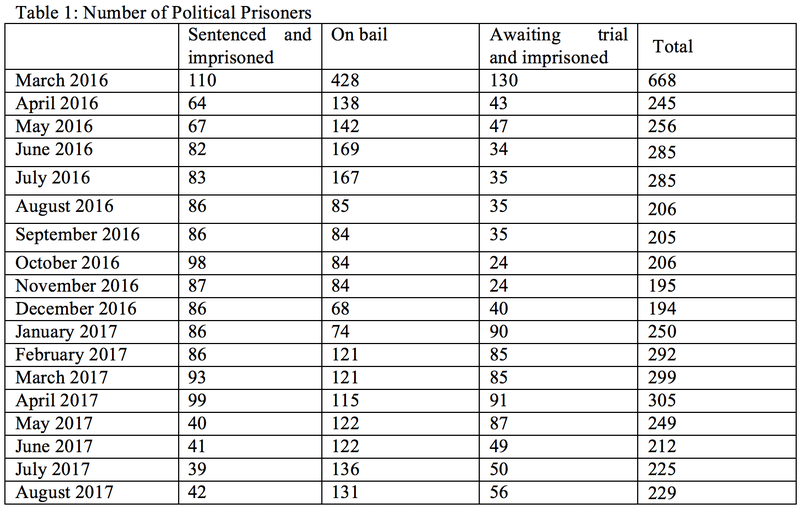 Source: Author compilation; data provided by the Assistance Association for Political Prisoners Burma (AAPPB) in their monthly chronicles. Whereas between 2011 and 2015 a large number of activists had been prosecuted under the Peaceful Assembly and Peaceful Procession Law, which was amended in 2012, again in 2014, and has been up for revision once again since 2016, many critics today are prosecuted under Section 66(d) of the 2013 Telecommunication Law on grounds such as “defamation”, often allegedly conducted by posts on social media. In the meanwhile, the NLD has been surprisingly passive in amending this particular law, which ascribes jail terms of up to three years. However, other progress has been made. The 2017 Bill on Personal Freedoms and Security (Pyidaungsu Hluttaw Law 5/2017), for instance, restricts the possibility of pre-emptive surveillance by the state and was introduced despite the opposition of the military. While one can only guess about what reason the NLD might have not to immediately amend laws used to repress free expression, one can hardly identify a systematic reversion of basic civil liberties under the NLD. It rather seems that the downside of free expression has resulted in the growing popularity of militant voices, which can spread hatred and fake news relatively unhindered. Consequently, it falls to the government to identify clear boundaries when it comes to freedom of expression and hate speech – which, however, is a topic beyond the scope of this article. Alternative sources of information prevent an information monopoly on the part of the state. To allow a free media to develop, journalists must be free from threats and other forms of repression. Myanmar today has a vibrant media landscape with some of the outlets having returned from exile in the wake of the country’s opening-up. While Thein Sein’s government had removed pre-publication censorship in 2012, sensitive issues are seldom covered, and state censorship in many cases has made way for self-censorship on the part of journalists. Red line crossings by journalists, however, have only been punished in exceptional cases, which, moreover, seem to have occurred less often over the years. However, attacks on the freedom of the press have still occurred under the NLD – more than five years after the lifting of censorship. Just recently, the military filed a criminal case against seven people, including one Irrawaddy and two DVB journalists, on allegations that the journalists had been members of a prohibited organisation. Despite the appropriate outrage this event has caused, its context is – arguably – very different from previous cases. First, the event has been extensively covered by the media (which also led to protests in support of the journalists); second, a Union Solidarity and Development Party (USDP) Parliamentarian, Thura U Shew Mann, spoke out openly for an amendment to the colonial law on which the charges were about to be brought; and, third, the military withdrew the case (referring to “wiping the slate clean”) despite the fact that the court had already twice rejected bail for the journalists (which might be indicative of the judge’s leanings). Besides the news media as a pillar for information provision, the internet has evolved as an important means to access information. In Myanmar, internet usage has increased significantly and censorship has been relatively lenient. Moreover, paired with the high level of entrepreneurial spirit present in Myanmar, state-independent services similar to those in long-standing democracies have evolved. A good example is the Open Hluttaw project, which provides information on MPs and their engagement in parliament, freely accessible in Burmese and English both online and via smartphone apps. In the light of these developments, it is hard to argue that Myanmar under the NLD has seen tremendous setbacks in press freedom. To put it simply, central to this criterion is that the government does what the people want. But the question is how can one assess the performance of the NLD without a second general election result (that might penalise policies made by the NLD) or opinion polls? Presuming that there are many shortcomings in the legal code in Myanmar which citizens disagree with and which a responsive government would be eager to change, one might, in a first step, look at the working of the legislature as a proxy for the introduction of more responsive policies. According to data collected by the Open Myanmar Initiative, from 2011 until 2015, 143 laws have been passed. Since the NLD came to power, this number has decreased significantly to only a fourth of the Thein Sein government. The same applies to questions and motions to the executive. However, one needs to stress the constraints the NLD faces in parliament. For constitutional changes, the NLD needs the support of the military block, which limits policies that are related to deeper-rooted democratic reforms. Moreover, it has been previously suggested that a general mistrust of the military towards the NLD government constrains collaboration and renders debates on constitutional change useless since the military would steadily fear a loss of power, which could, for example, be seen by the debate on the 2015 Constitutional Amendment Bill. Nevertheless, the number of laws or amendments is not necessarily representative of government responsiveness to citizen preferences. As a matter of fact, the NLD established a large number of parliamentary commissions, covering almost all basic policy areas, in order to develop policy recommendations. Only a few commissions have, however, have concluded their work, which has kept their impact on the policy outcomes quite small up to now. Much of the NLDs scope to responsive policy-making is restricted by the military’s outstanding role in the current constitution. Arguably, the largest majority of the citizenry disregards the current constitution, which assigns 25 percent of the seats in both chambers of Parliament to members of the armed forces, granting them an effective veto power, in addition, it preserves key ministries (not to mention the constitutional role of the National Security Council.) This constitutional setting has led to the establishment of a “shadow government” free from governmental-oversight but which has access to nearly 14 percent of the state’s total spending. While the NLD government probably doesn’t meet most people’s expectations in terms of democratic reform, it is quite exaggerated to argue that Myanmar has experienced an authoritarian rollback under the NLD. But why has there not been more democratic progress under Aung San Suu Kyi’s reign? The reason might lie in the fact that the NLD ran on a program placing an emphasis primarily on peace and prosperity and only secondarily on democratic reforms. Another reason for slower progress under the NLD compared to the Thein Sein government is also based on the different nature of the reforms needed. While under Thein Sein almost every simple reform towards liberalisation has been hailed domestically and internationally, fostering further democratic reforms nowadays has become far more demanding since it, in many instances, requires more substantial changes. Andy Buschmann (@andybuschmann) is a graduate student at the Department of Politics and International Relations at the University of Oxford and on the board of the Berlin-based Myanmar-Institut, a think tank and network connecting researchers working on Myanmar. Image credit: CC by President of Russia. Of course implying that one can apply liberal democratic theory in Myanmar.